Pioneers in the industry, we offer Testing Panels such as Transformer Testing Panel and Pump Testing Panel from India. Our assortment is developed from superior quality raw material such as metal sheets and other electrical goods. We have exported our Instruments to More Than 26 Countries like USA, Colombia, UK, Belarus, Czech Republic, Germany, Italy, Poland, Romania, Spain, Switzerland, Turkey, Congo, Ghana, Saudi Arabia, Morocco, Zimbabwe, Bangladesh, Iran, Nepal, Pakistan, South Korea, China, Malta, etc. We are the leading manufacturer, exporter, and supplier offering highest quality & the wide range of Potential Transformer Test Panels, which are of very much use and requirement in a wide range of industrial and electrical utilities. We are providing these potential transformers to our clients at a very commercial range of prices. 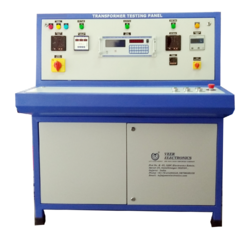 We are the leading manufacturer, exporter, and supplier offering highest quality & the wide range of Transformer Test Panel, which are of very much use and requirement in a wide range of industrial and electrical utilities. We are providing these potential transformers to our clients at a very commercial range of prices.